Facebook, Instagram, Twitter, LinkedIn, Pinterest… you name it, it’s our digital playground. We can create, grow and nurture an engaged and targeted audience for you. So what’s the deal with social media? 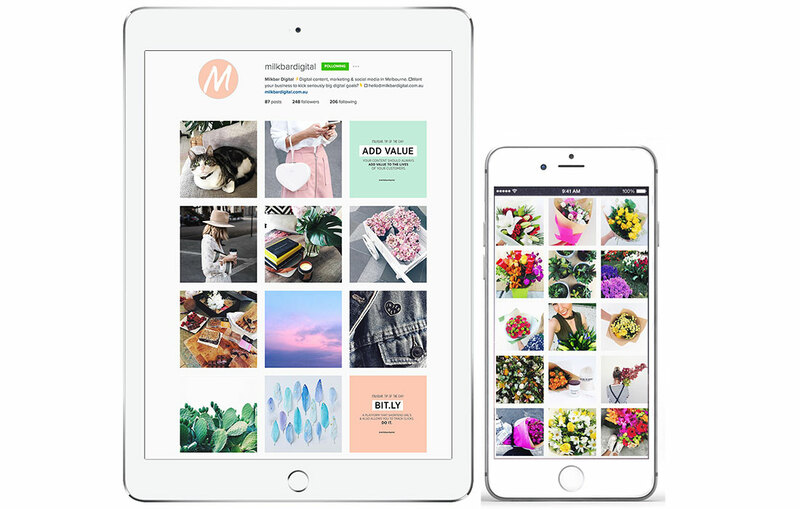 With over 5 million monthly active users on Instagram and the average Australian social media user checking in over 5 times a day to varying social channels, you’d be crazy to think this isn’t a place your business should be! The opportunities with social media marketing are endless. From Facebook’s paid advertising opportunities through to creating beautiful eye-catching photographic moments on Instagram, we know how to make social media work for you and your business. Followers = eyeballs. Eyeballs = brand awareness. Brand awareness = customers. It’s no longer enough to simply exist on these channels, you have to know how to use them properly. Then please, allow us! A common complaint we hear is that business owners are too busy running their business to spend time documenting, photographing, captioning, hashtagging and snapchatting about it. Which is where we can come in. We can help you create a robust social media calendar, or even provide ongoing management of your social media channels for you – so you don’t need to do a thing! It can be for one social platform that you don’t have time for, or all of them! Unfortunately, no matter how awesome the content and messages you push out onto social media like Facebook and Instagram is – it won’t get the traction or engagement you’re seeking unless you invest money into it. This is called Social Advertising – and it doesn’t have to break the bank. If you invest your dollars in a smart way, you can achieve greatness with your social media advertising. Ever seen “sponsored” posts or advertisements while you’re browsing Instagram and Facebook? We can help you target the exact right audience to be sharing your content with, in order to maximise it’s effectiveness and give you the best possible ROI! If the words “Twittersphere” and “Regram” simply mean nothing to you at all, we can also start right from the beginning and identify the most effective channels for your business to be on, help your build and grow an engaged, quality audience (not followers for the sake of followers) and help you delight and retain them. Want to know more? Be sure to read our article ‘5 ways to improve your social media channels‘. Milkbar Digital is a Melbourne social media agency – start a conversation now. Now open for business, Milkbar Digital is a Melbourne digital content, marketing and social media agency. We help small businesses kick seriously big digital goals. Talk to us about how we can help you achieve online awesomeness.